Tag line: "This holiday season comes a story for everyone who ever needed a restart on life"
Disney’s Wreck-It Ralph does for video games what Toy Story did for toys; creating a world filled with wonder, where the characters and games we grew up with are given a life of their own. 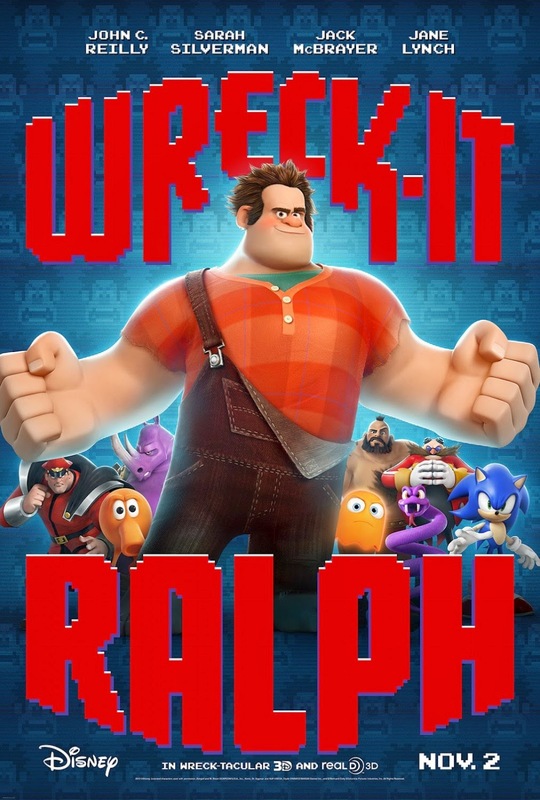 For 30 years, Wreck-It Ralph (voiced by John C. Reilly) has been the villain in the popular arcade game “Fix-It Felix”, spending every waking minute destroying an apartment building that the “hero”, Felix (Jack McBrayer), then repairs. Even at the end of the day, when the players have gone home and the arcade shuts its doors, poor Ralph can’t get any respect (he isn’t invited to the game’s 30th Anniversary celebration, watching it instead from the garbage dump he calls home). Hoping to change his luck, Ralph leaves his own game and ventures into the high-tech, battle-oriented world of “Hero’s Duty”, where he joins an elite team of warriors led by the beautiful but tough Calhoun (Jane Lynch). Joining the fight against thousands of alien bugs, Ralph hopes to win the coveted medal awarded at the end of the game, which he believes will prove, once and for all, that he can be a “good guy”, too. Ralph does win his medal, but a mishap with an escape pod launches him (as well as a killer bug) out of “Hero’s Duty” and into “Sugar Rush”, a race cart game in which the entire world is made of candy. It’s here that he meets Vanellope von Schweetz (Sarah Silverman), a bratty little girl who, because she’s considered a programming “glitch”, has been shunned by her peers. Hoping to show she isn’t just a “glitch”, Vanellope steals Ralph’s medal and uses it to pay the entry fee for an upcoming race. At first upset with Vanellope, Ralph (who understands what it’s like to be an outcast) eventually agrees to help her, angering the King of “Sugar Rush” (Alan Tudyk), who insists there’s no place for a “Glitch” in his kingdom. Meanwhile, Fix-It Felix (who, without Ralph, has nothing to fix) has teamed up with Calhoun to try and locate both Ralph and, even more importantly, the bug from “Hero’s Duty”, which, if loose in “Sugar Rush”, will destroy everything in its path. Right off the bat, I was blown away by the world the filmmakers created for Wreck-It Ralph, where characters from one game can travel by tram car through the wiring and into another (in the opening scene, Ralph is attending a villain’s support group hosted by one of the ghosts from “Pac-Man”). What’s more, the surge protectors act as a sort of train station, complete with a Customs Officer who checks to make sure you aren’t bringing fruits and vegetables from one game into another. While some of the games in this particular arcade are fictitious, and used to represent actual ones (“Fix-It Felix” is clearly “Donkey Kong”, and “Sugar Rush” has a lot in common with “Mario Kart”), others are the real deal (along with “Pac-Man”, Ralph has a run-in with Q-Bert, who’s homeless now because his game was disconnected). As someone who spent a good deal of his youth hanging around arcades, I immediately fell in love with this incredibly detailed world. But like Toy Story, there’s more to Wreck-It Ralph than mere spectacle. In fact, one of the film’s major strengths is its characters. A big, lumbering oaf who only wants to fit in, Ralph is someone most people can identify with, and John C. Reilly (who doesn’t bother disguising his voice) brings just the right mix of pathos and determination to the character, making him sympathetic, but strong. I also liked Vanellope, who, despite being an obnoxious brat early on, wins us over with her enthusiasm (the scene where she and Ralph break into the car factory is a lot of fun). In a nice twist, the filmmakers even portrayed Felix, Ralph’s in-game foe, in a positive light, giving him an “Aw Shucks” personality yet still allowing him to be more than your typical game hero (in a brilliantly bizarre romantic subplot, Felix falls in love with Calhoun). Like many of Disney’s best films, you’ll adore the visual splendor of Wreck-It Ralph, but it’s the characters that will stay with you. Never saw it completely though. Tried watching with my kids after working all night. Not a good thing. I must try again. My kids loved it.